Tile Flooring | Collins Flooring America - Belleville, ILWe have a new 800 number, but you can still call us at 618-234-2915 if you prefer. 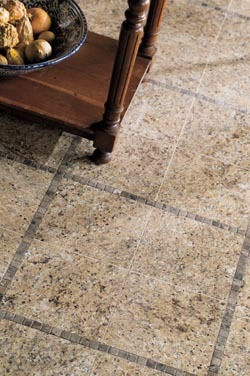 Save money on tile flooring by shopping at our showroom. You'll discover a huge selection of porcelain, ceramic and slate tile from many of the industry's top manufacturers. In addition, we offer a fast, professional installation service for all of the products we sell, which makes us the perfect choice for anyone remodeling a home or business. Our knowledgeable sales and installation teams are standing by to help you improve your property with a stunning new floor. If you’re tired of your worn-out floors, give your feet something new and stylish to stand by coming to us for tile flooring. We offer a wide variety of products that dramatically transform the look of your floors and the ambiance in your rooms. From ceramic and porcelain to natural slate floors, we improve the value and appeal of your home. Your home will have wall-to-wall beauty when you lay tile floors. Our flooring options come in all types: smooth, textured, glazed, unglazed, polished, and unpolished. Choose a traditional look or one that is more contemporary. You don’t have to limit yourself. If you need help, simply ask one of our knowledgeable and friendly flooring specialists for assistance. Some of the brands we carry include Star Values and Floorcraft. Ceramic tile has been used for many centuries in architecture and decoration. Cultures around the world have used this versatile material to create beautiful floors, walls, and mosaics. Modern designers often use tile in bathrooms and kitchens because it is very resistant to moisture and easy to clean. A new tile floor looks and feels great. Tile is also perfect for any room that is prone to moisture, splashes, and spills. When properly installed, it is virtually impervious to water and stains. A quick mop with soap and water will leave your floor looking as good as new. Tile is also extremely resilient and will last for many years with only minimal care, which makes it one of the most cost-effective flooring materials on the market. Take your design to the next level by using porcelain tile in your kitchen or bathroom. Porcelain is a special kind of ceramic that is made from finer clay and fired at a higher temperature than other kinds of tile. This manufacturing process results in a harder, denser tile that's perfect for flooring and other purposes. The extra density makes it extremely durable and resistant to stains and fading. It is a sought-after material that makes a stylish statement in any home or business. Discover the outstanding beauty of natural slate tile at our showroom. Slate is a type of stone that is highly durable and waterproof, which makes it ideal for floors, showers, and backsplashes. A professionally installed slate floor lasts a lifetime and can greatly increase the value of your home. Kitchens and bathrooms are two of the most important areas for homebuyers; and a slate tile floor will be a striking selling feature as well. Tile flooring installation doesn't have to be expensive. We sell and install tile floors at extremely competitive prices. As professional installers, we work quickly while paying close attention to detail. We are proud of our work and go above and beyond to ensure you are happy with your new floor. As a naturally modular material, tile can be used to create an almost unlimited variety of patterns and designs. Tiles come in a huge range of colors, shapes, sizes and textures; and they range from opaque to almost transparent. The possibilities are endless. Architects and designers are using tile in all sorts of creative ways. Our team stays up-to-date with all the latest trends. If you need advice, guidance, or ideas, please don't hesitate to ask. We're always happy to help customers transform their homes or businesses with beautiful tile floors. Contact us in Swansea, Illinois, to discover the right type of tile for your property.We proudly serve homeowners in the communities of Swansea, IL and Belleville, Fairview Heights, O'Fallon, Shiloh, Mascoutah, Scott Air Force Base, Freeburg, Millstadt, Caseyville, Collinsville, Maryville, Glen Carbon, Smithton, Waterloo, and the surrounding Metro East community.